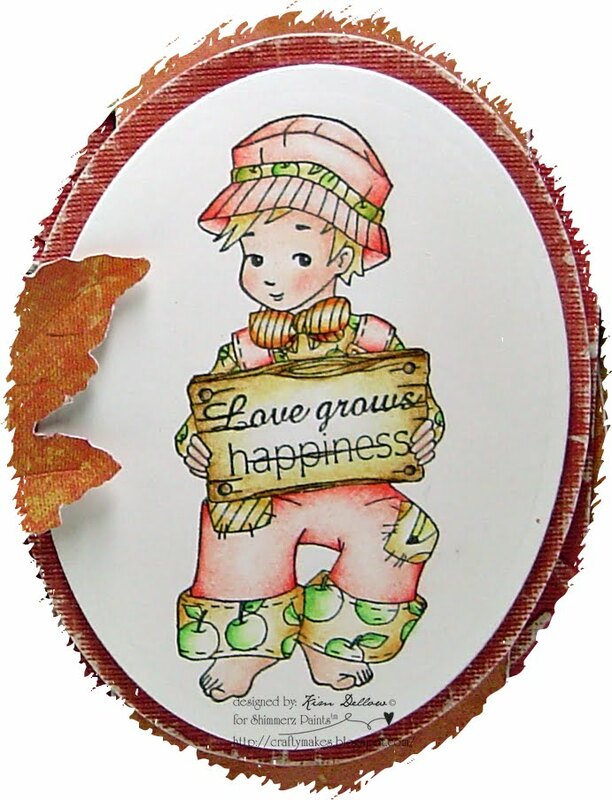 Autumn has arrived here in London and I have an autumnal card for you with a boy twist 🙂 I’ve used the lovely Whiff Of Joy Oakley With Wooden Sign stamp and cheated a bit because he is actually from the Summer 2009 Kit…but I wont tell anyone if you don’t? The papers are K&Co Ancestry with a touch of distressing here and there helped with a Cuttlebug embossing folder. I’ve also used some fibres which I think I might actually have got from ripping up an old piece of fabric LOL! I used a mix of Prismacolor, Koh-I-Noor and Derwent pencils to colour him. Then added a bit of detail to the woodware punch and embossed leaves with my Shimmerz Paints Spiced Cider Blingz and Choc-o-lot. The apple charm is from Quixotic Paperie. Elaine had the brilliant idea of colouring the charms with Shimmerz paints (Clever!). I’ve also used a bit of Rub and Buff on the charm, which has given it a bit of a rough texture, don’t you think? But before I go just thought I would mention that the pre-order for the Autumn Belles and Whistles Stamps opens tomorrow at Quixotic Paperie and they are beautiful. So to celebrate, starting today for a limited time only, there is 20% off of the current Belles and Whistles stock! But not only that, there are the new lines of Prima bits and pieces in store now – pearls, flowers, the new economy line all just gorgeous, you will just want! I know I do! LOL! Next postAnd The Winner IS…..
ohhhh wow – sooo cute! Love your colors and the way you did the embossed background! This is gorgeous! The leaves are beautiful and I love the charm. Superb card! Absolutely gorgeous! Loving the Shimmerz covered charm!!! OMG Kim this is absolutely darling. Really awesome card. Love them. Great color combination and texture. This image is so sweet! Your autumn card is gorgeous. Great work! 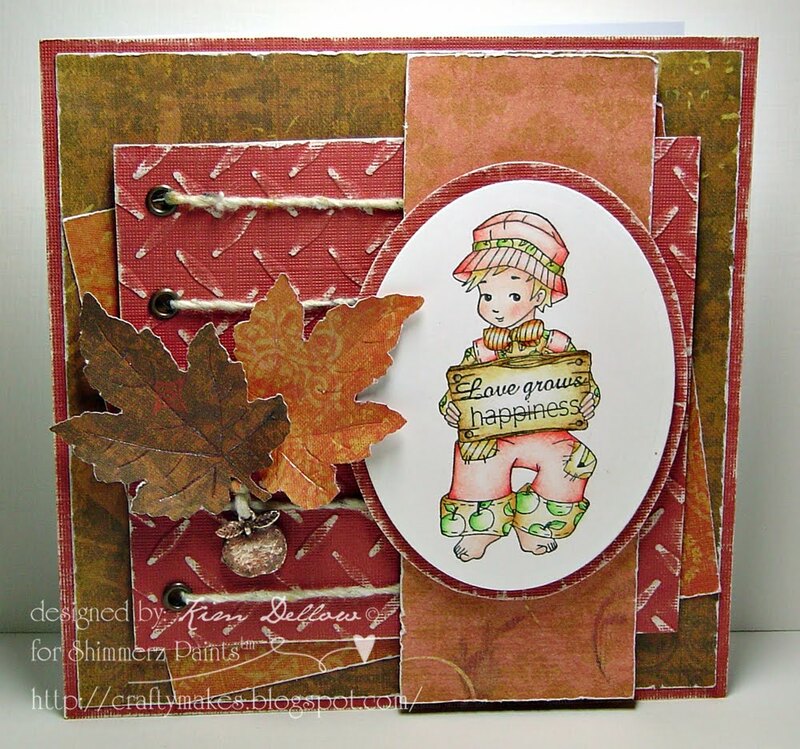 Kim this card is gorgeous, Love the Autumnal colours, your colouring is amazing too. Gorgeous work Kim! Love your bits of details! Kim this is SOOOO SWEET!!! LOVE that image and those leaves girl WOWZA!!! Beautiful designed card! Absolutely stunning Kim. Love all the techniques you've used on this and a pefect celebration of autumn. Kim this is so gorgeous! The rich colours are fab and those leaves are amazing! LOVE what you've done with the charm too – will have to find out more about this technique I think! Thanks for visiting my blog!! This box I made for put tea bags!! I love it your arts!! This is beautiful Kim – very autumnal. Love the textures and the distressing. thank you for entering my blog candy. just gorgeous!! such a sweet image, and I just love how you have made the leaves!! love it! Absolutely gorgeous Kim. 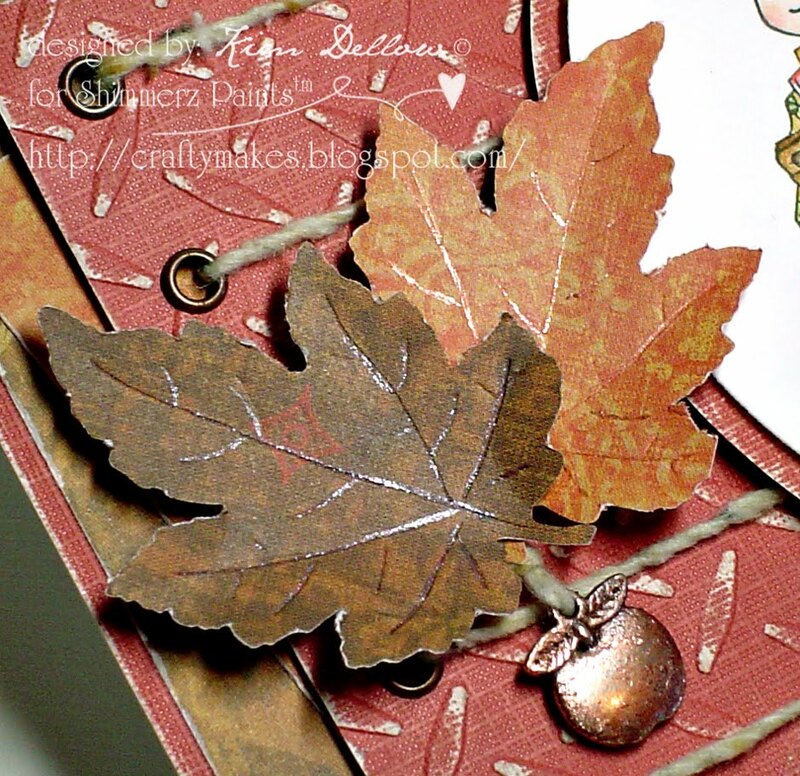 Just love the papers you have used, so warm and rich and those leaves are just fantastic. How clever covering the apple with Shimmerz too – makes it look the part ! What a gorgeous little chappie and those leaves are stunning. Love how you did the leaves.